17 year old Aerin is the only daughter of the king of Damar; by rights she should inherit the throne, but the mystery surrounding her mother’s heritage stands in her way. Some say her mother was a witch come from the Northern lands to ensnare the heart of a powerful king, but since her mother died on the same day that Aerin was born, and since her father refuses to disclose the truth, Aerin’s only choice is to believe what her fellow Demarians say, that Aerin is merely a witch’s daughter, and as such, is only a half-blood and has no right to rule Damar. It isn’t that half of her ancestry is a mystery that troubles Aerin the most; rather, it is the continual feeling she carries with her that her destiny lies in a completely different direction than the role she feels she is born to fill. For what Aerin soon discovers is that the heart of a warrior lies within her and it is she who will rid the countryside of pesky dragons and she alone who will eventually restore peace to her besieged country. The Hero and the Crown is a surprising book. For one thing, the hero is a humble princess whom the reader first sees as impetuous and insecure rather than brave and stalwart. But as the reader comes to know Aerin, she comes to know herself and finds confidence and courage that we realize was hiding within her all along. Another surprise is the newness of the setting and the characters. In a similar way that the Chronicles of Narnia introduced us to new landscapes and deep magic, The Hero and The Crown reveals an entirely new world, one in which royal blood contains the “Gift” of magic, and wild plants provide the eater a chance to look for truth in their dreams. There are new creatures to get to know, like the queen of the wild cats, and there are new terms to learn from an unusual language of the other-worldly Damar. 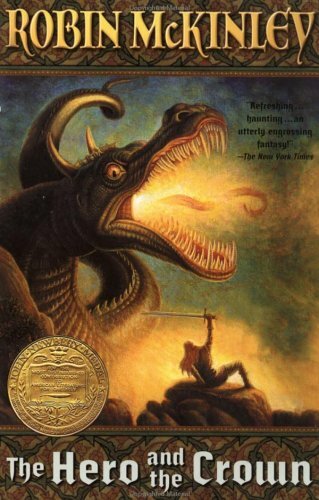 Because I did not read The Blue Sword before I read The Hero and the Crown, I found some parts of the story confusing and difficult to follow, such as the whole encounter with the wizard Luthe. It is not immediately clear exactly where Aerin and Luthe are, what exactly they are doing, or how much time is passing. They seemed to have stepped outside of time, but it was hard to tell. I also didn’t understand the relationship between Aerin and Luthe. Luthe defended his need for solitude and yet he seems not to be able to bear parting with Aerin; their attachment wasn’t well-developed enough to allow the reader to comprehend their tears when they parted ways. McKinley spent so much time early in the novel developing the character Tor and making us fall in love with him, that we only want Aerin to go back to him as soon as she is healed. It was frustrating that she wanted to stay with Luthe for so long when her father, her country, and her love were in peril. Tor seemed much more honorable than Luthe and I found it annoying that Aerin preferred Luthe to Tor. Despite Aerin’s muddled romantic feelings, I thought this was a great book trek. I became fully engrossed and I couldn’t wait to find out what happened to Aerin and to her beloved country. Readers of fantasy will definitely enjoy this book and I fully intend to read The Blue Sword as well, because I would love to go off on another adventure in the world of Damar. I would recommend The Hero and the Crown to young adults aged 13 to 18. The main character is 17 at the start of the novel and is turning 19 at the end. She struggles with romantic longings (for two men), which is why I wouldn’t go too much younger than 13, simply because it might raise some issues that younger readers are not ready for. I 100% agree with you. I just finished it last night and the whole Luthe thing was annoying and not clear. I was like “what is going on?”. Glad I wasn’t the only one! I still want to read the other books in the series one day because there’s definitely something there. Thanks for commenting!